With the adaptation and implementation of the Next Generation Science Standards (NGSS), many teachers have been asked to alter their pedagogy. Rather than teaching traditional content-heavy curriculum, it’s expected for curriculum to be more exploratory, and students should model the process of doing science by actively engaging science literacy skills. As with any top-down state mandate, the need to implement NGSS and distill the expected curricular content has presented some challenges. One such challenge for my curricular team was to create a new learning target in our covalent compounds unit: long-chain polymers. The need to develop a test question on this topic prompted the discussion of what we want students to know and be able to do with information about polymers. Initially, our conversation about the test question focused on the identification of a polymer from various structural formulas. I felt unenthusiastic about the initial idea of a simple identification question, and challenged my colleagues to consider its real value for us and our students. We delved into a wonderful conversation about recycling and how we could have students apply their knowledge of covalent compounds to the recycling system. Figure 1 and Figure 2 show how the initial identification question evolved into a more thought-provoking and practical question in light of NGSS. We admitted that our resistance to having students learn about recycling and long-chain polymers was based on our own ignorance of the recycling system. As my colleagues and I embarked on an expedition to learn more about polymers and recycling, we began to embody the spirit of NGSS. It is my hope that our curriculum conversations will become ever more focused on ways we can use tangible applications, like recycling, to get students not only to understand and communicate science principles, but also be curious about the value of chemistry in their lives. As teachers, we have the privilege of modeling lifelong learning. 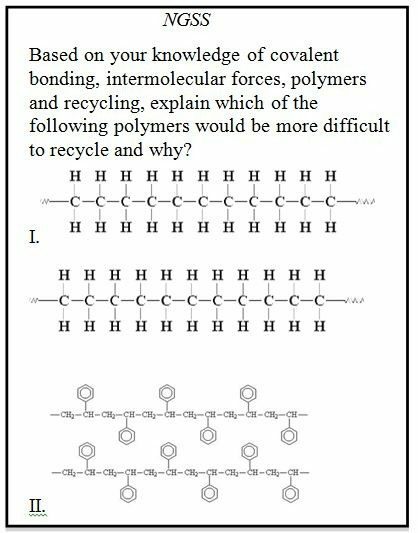 My curricular team embraced this role, beginning with our admission of not knowing enough about the relationship between long chain polymers and our recycling system. However, through our dialogue, we reaffirmed our commitment to guiding students towards finding practical applications of chemistry in their lives and engaging their critical science literacy skills. In today’s age of standardized testing, many teachers have been asked to teach to a test and leave creativity for another day. Within our science classrooms, we have the opportunity to resist the testing movement by allowing and empowering students to creatively explore, reflect upon, and refine their understanding of the world. We must deliberately find ways to incorporate the joy and excitement of discovery into our practice so that students are enabled and empowered to be critical problem solvers. Prior to NGSS, our curricular team believed that more content was better, lecture and cookbook labs were good ways to illustrate concepts, and multiple-choice tests were the best method of assessment. For example, before implementing NGSS, we taught naming covalent compounds through lecture. Since we have been working on modeling and engaging in the process of doing science, we have given students more agency to discover and develop their understanding of the naming conventions for themselves (I have included related resources in the Naming Covalent Compounds lesson). By asking students to be more reflective and metacognitive, we guide them not only in the process of learning, but also in developing their ability to become lifelong learners and more engaged, scientifically literate citizens. NGSS has helped shift our curricular conversations from what teachers want to teach and test, to reflect the chemistry that is most relevant and valuable to students’ lives. The shift is also visible in the transition from traditional to more dialogical methods that engage students in active learning to foster their science literacy skills. This alternative approach could be as simple as asking students to examine the nutrition label on a food item and link food additives to chemical formula, leading to an exploration of how additives interact with the body. It could also be something more elaborate, like a model symposium (see sample project, Understanding Renewable Energy) that addresses which renewable energy sources would be most beneficial for students’ schools or towns. As students discover chemistry concepts and applications, we must also be willing to participate in the discovery process with them. NGSS is not only shifting the mindset of our curriculum content, but also the spirit of our classrooms. This shift certainly takes time and patience, and is sometimes met with resistance. However, by being mindful of the process and nature of science, and the value of chemistry in the world, we can begin to engage in a critical examination of our classrooms. Where simple identification-type and overabundance of content were once the norm, by embracing the spirit of NGSS, our classrooms are shifting to promote the growth of scientifically literate critical problem solvers, and lifelong learners. 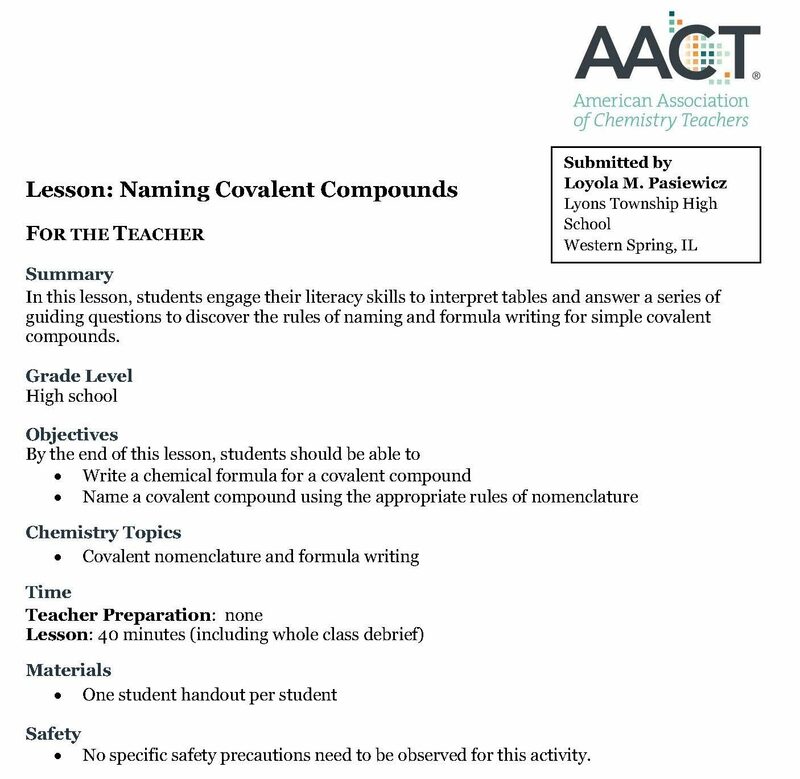 Download this Naming Covalent Compounds Lesson, from the AACT resource library. 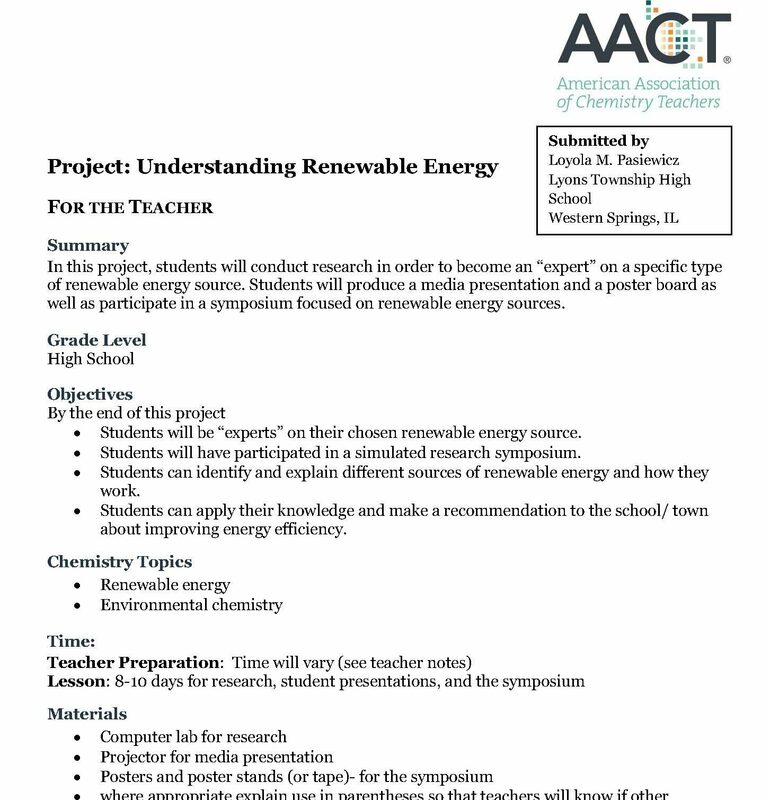 Download this project, "Understanding Renewable Energy," from the AACT resource library. Loyola M. Pasiewicz has been a public high school chemistry teacher for seven years. She earned a B.A. in chemistry from College of the Holy Cross in Worcester, MA and an M.A.T. in science education from Boston University.